Thinking back on how many toys the kids have had over the years, I am flabbergasted by the number of toys that served their purpose for a relatively short time. In some cases, my kids simply had no interest. In others, the kids outgrew them faster than the designer outfit their aunties bought for them for Christmas. With the exception of a really sweet party thrown together by colleagues at my first school here in Toronto, I never had a baby shower so we were very particular with what we purchased for our growing babies. Several toys the kids enjoyed in their toddler years were in fact handed down from my nephew or from my goddaughter once they no longer needed them, many of them bearing the Fisher-Price logo. 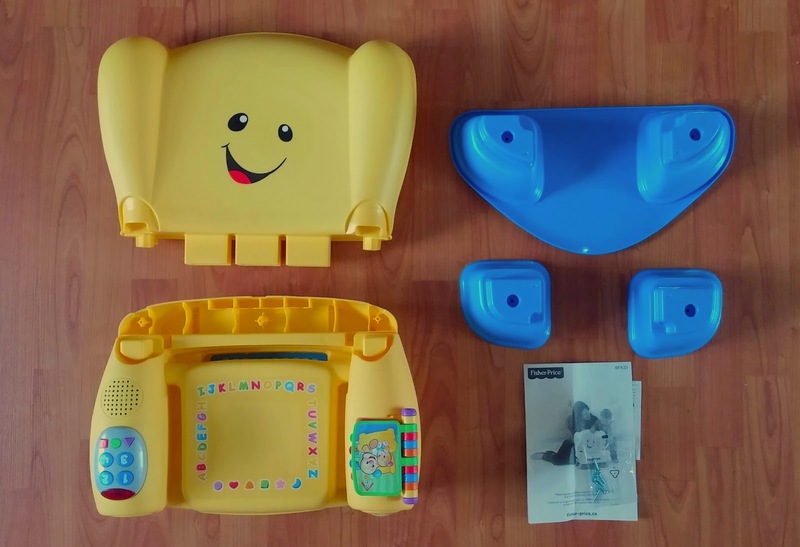 These were the toys that I look back on with fondness, in addition to a must-have nursery item - the Fisher-Price Cradle N Swing - which I had purchased second-hand. Not only were they sanity-savers, they were extremely durable and withstood endless hours of play even after three or four children outgrew them. But just imagine if they could last even longer, adapting to developmental stages as your child grows, just like the new Fisher-Price Laugh & Learn Smart Stages Chair! One of the things my kids liked to do when they were infants was mimic mom and dad. They wanted to be just like the big people and the original Laugh & Learn chair was perfect for that. 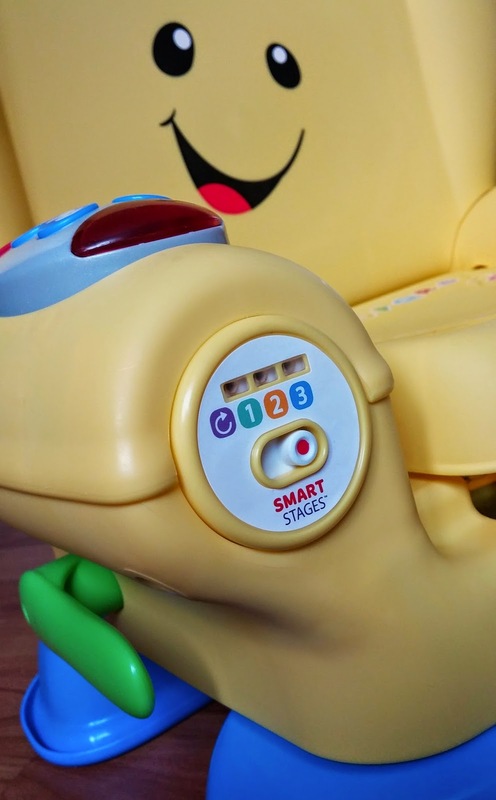 With the NEW Smart Stages Chair, little ones can do that and whole lot more. And with simple, straightforward assembly, mom and dad can have the chair ready in no time. It comes with five parts, screws and instructions which I suggest you read first. It took me less than five minutes to build before I realized that it is much easier to install the batteries first before assembling the rest of the chair. Also note that the conjoined rear legs have a protruding lip which helps prevent the chair from tipping backwards when baby tries to mimic daddy's infamous reclined position. 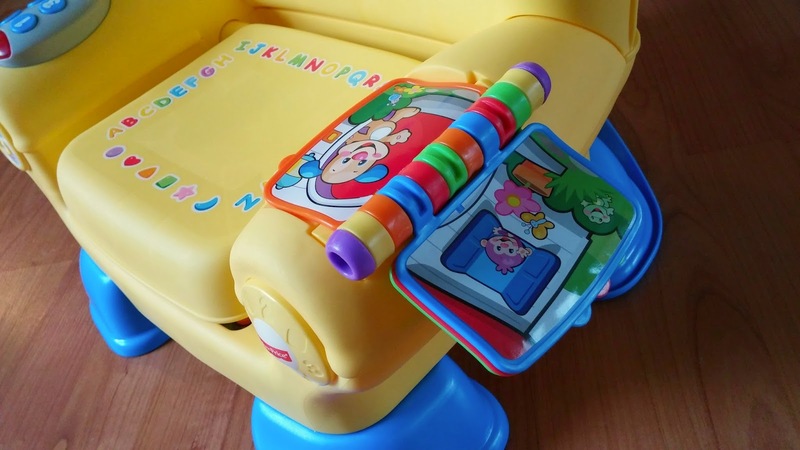 The Fisher-Price Laugh & Learn Smart Stages Chair has a similar flip book as the original with brightly-coloured images. 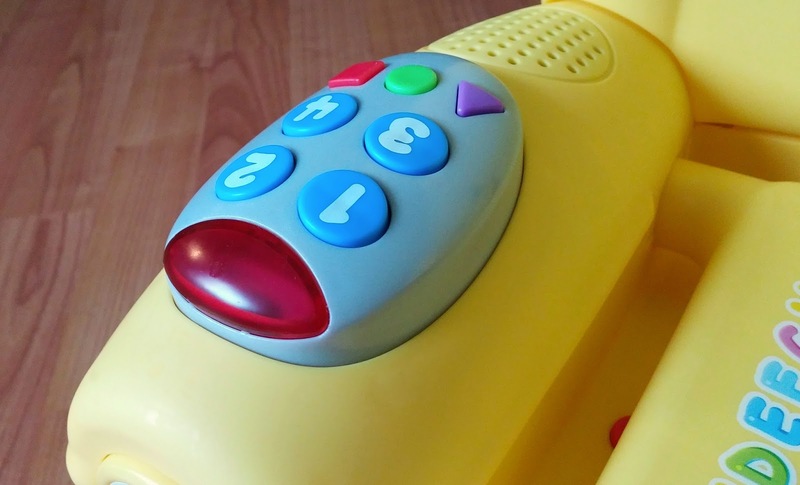 In lieu of a lamp, the new chair has a light-up remote to help teach baby about numbers and shapes. It also features a "magic" ABC seat that knows when baby sits, activating learning songs and phrases when baby stands. And the lift-up cushion is perfect for a fun game of peek-a-boo. But what makes this chair so unique is the Laugh & Learn Smart Stages technology. 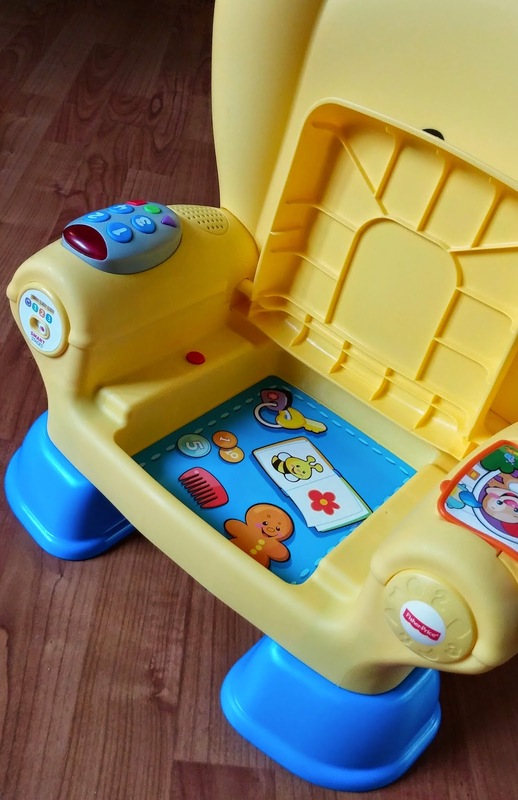 It is what allows this chair to evolve with age-appropriate learning content that suits your child's learning stage, all with a flip of a switch. 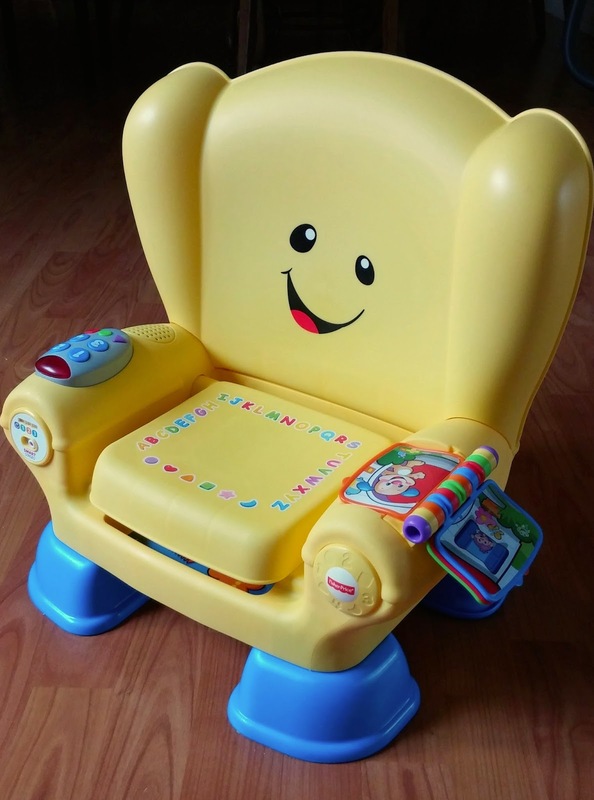 Fisher-Price Laugh & Learn Smart Stages Chair is on the Walmart Canada Top 20 Toys List! Don't forget to check out the fun online games and apps designed to complement your child's learning. The Fisher-Price Laugh & Learn Smart Stages Chair retails for $49.99 but is currently available at Walmart for $44.94. And yes, it also available en français! 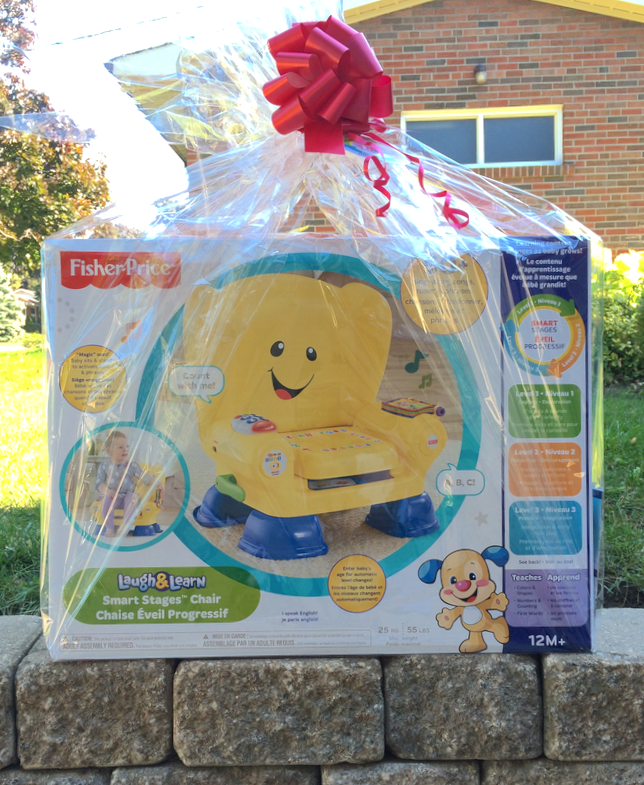 Luckily, Fisher-Price has offered up a Laugh & Learn Smart Stages Chair to a lucky reader here on Toronto Teacher Mom. For a chance to win, please complete the Rafflecopter form below. Open to Canadian residents only. I love the toys they are really cute and that chair for example is a great way to increase motor and creative skills! Love how it grows with my child. I like that they are well thought out as far as age and development goes. I like that they stay current and grow with the child. I really like that the toy grows along with your child. And Fisher Price means quality! Its great the toys are thought out enough to last a few stages. I like that the three Smart Stages levels of play help in the learning process. I like that it transitions with your child! I like that the 3 different levels of the chair that grows along with the child. It also has a great price point as your child will be able to use it for quite awhile. I like that it is usable with different developmental stages. I love that it ages with your child! I love how they're educational, encourage imagination and extremely fun all at the same time. I like that it has stages and grows with your child. I love that as the children develop the toys are able to teach them new things through fun and play as they grow. I like that they grow with them - they can use the same toys for years and not get bored! Love that it grows with my child! Love that it grows with my granddaughter! I love that the toys grow along with my child so that they are not just for one stage! I love how reliable they are! My son is a rough little boy!! Love that it evolves with your child! Its adorable! Funny enough 8 years ago my oldest had one of these, its very similar but it didn't have stages and that's why I love how it "grows" with the child and you can set it to a different setting as they grow older! What I like most about the new line of Fisher-Price Laugh & Learn Smart Stages toys is that they grow with the child and are very interactive. I love how they grow with your child and all the interactive plays so the child will not get bored!! I like all the different levels from baby to toddler. I like that you can update it as baby grows!! I like that this grows with your child. I love that these toys grow with your child. They have fun and learn as they grow. I love that they can use these toys for a few years. My son loves toys with buttons that make noises! I love that smart stages toys adjust to kids growing. Make it a well worth purchase. I love that it has three different levels for the children to use as they grow and learn more. I like the 3 stages that allows the toy to grow with the child! I like the three stages of learning for children, it's very versatile and aids in a childs development. I love that the toys grow with the children for different levels of play. I love the 3 smart stages levels of play...how cool is it that a toy can grow with a child?!!! I love that it changes when your child changes and grows and it is very cute. I like how they grow with the child. I love that the new product line grows with your child. that is THE best feature they could have added to a toy. It's so smart and i'm so happy to see a whole line available. I love all the interaction/activities and that they grow w/ur child pretty much! Love the three stages....well worth the purchase!! I like the age appropriate learning. I really line this line. I love that this toy will grow with my child!